I wanted to cross over the Mekong River to watch the boat race but was not able to since I was waiting for a call from Wattay Airport about my luggage. I have not heard anything all day and was on a waiting mode and didn’t make any plan and only wandered around the center of Luang Prabang checking out the familiar places. Even though it would be only a few minutes crossing to the other side and then back, I was not willing to take a risk of not being able to get my stuff on a last flight coming out of Vientiane. 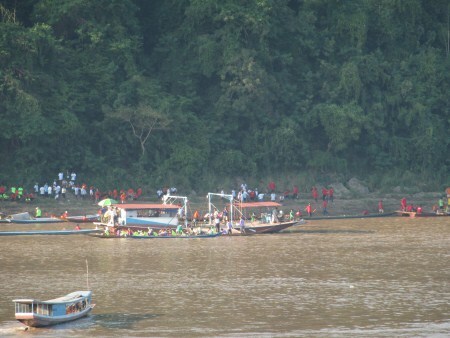 What I did was taking a stroll along the Mekong River and observe the race from a distance and told myself to come back for the real boat racing festival with more boats and more fun in the future.